Aside from The Red Eagle, I've been underwhelmed by the offerings of Thai action flicks (*cough Ong-Bak 3 cough*) this year. So I'm looking forward to this Thursday's local release of B.K.O. 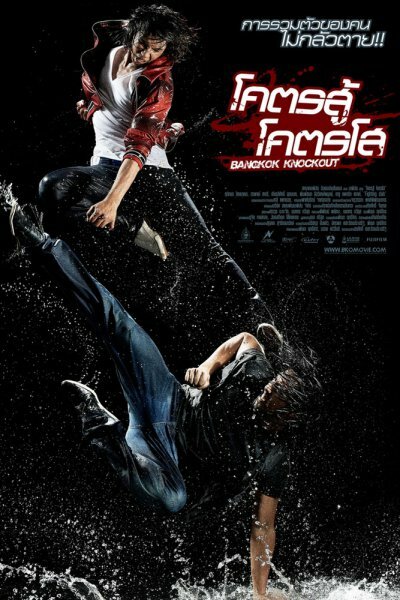 : Bangkok Knockout (โคตรสู้ โคตรโส, Koht Soo Koht Soh) as a welcome break from the romantic dramas and cookie-cutter slapstick comedies that are the usual Thai offerings. Stunt guru Panna Rittikrai, the mentor of Tony Jaa, directs this one, and he's seeking to outdo all the insanely dangerous-looking action he displayed in the 2004 stuntfest Born to Fight. Among the notable setpieces is a truck stunt that Panna has said was way more complicated to put together than the truck stunt from Born to Fight – you remember the one where the dude almost had his head crushed under a truck's wheel in the final take? Bangkok Knockout is the story of a college "fight club" whose members are together for a reunion when one of their number is kidnapped. So they have to combine all their mad skilz – Muay Thai, kung fu, capoeira and other forms of badassery – to rescue their friend. The cast of fighters are mainly guys who've been playing stunt doubles in movies choreographed by Panna and his crew at Prachya Pinkaew's Baa-Ram-Ewe studio. But among the recognizable names, there's Kazu Patrick Tang, the French-Vietnamese martial artist who co-starred with Jija Yanin in Raging Phoenix. Other marquee draws for Thai fans include comedian Kiatisak "Sena Hoi" Udomnak, actress "Kratae" Supaksorn Chiamongkol and veteran action star Sorapong Chatree. In addition to the English-language trailer, there's also a Thai trailer, and you can watch it here.